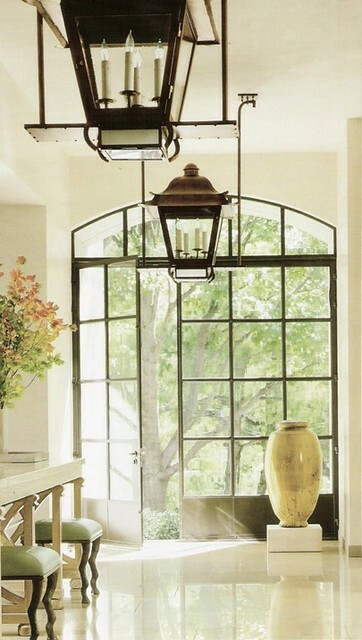 In June of 2009, I wrote a post on my love for steel windows and doors. Many of my pictures came from houses in Atlanta, where steel windows and doors have been a favored architectural and design element for years. At the time I wrote the post, I was particularly enamored with this picture, taken on a home tour by fellow blogger Architecture Tourist. I had no idea at the time that the house in this picture is owned by Jill Sharp Brinson, creative director of Ballard Designs. Jill’s beautiful house was featured in House Beautiful in January 2010, and I immediately made the connection between the kitchen quickly photographed on the house tour, and the magazine feature – mainly because of the dramatic arched steel window. In this picture, via House Beautiful, the window can be seen in all its glory. In Jill’s words – “the showstopper in my kitchen is the 14-foot-high arched steel window and door. The drama is big in here." Jill has a lovely arched steel window in her bedroom too. Note that there is no window treatment – the greenery in the yard provides privacy. Jill must like to be woken by the morning light! Image source. A few months later, this house in Houston was the cover story of Veranda. 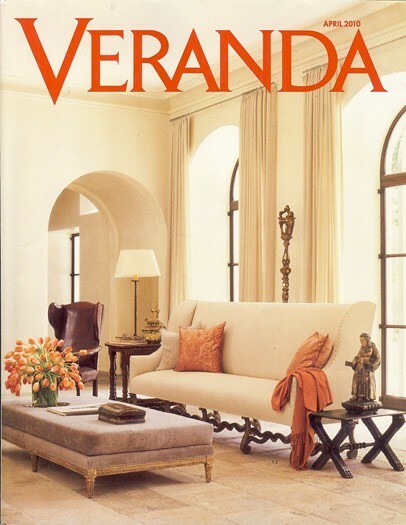 With architecture by Murphy Mears, and interior design by Eleanor Cummings, this has got to be one of my all time favorite Veranda covers. There are so many things about the space that have great appeal to me – the largely neutral décor accented with dark woods and bursts of color in the pillows, throw, and flowers. But most of all, I love the arched steel windows whose darkness contrast so beautifully with the lightness of the décor, and whose style works so beautifully with the architecture and design. 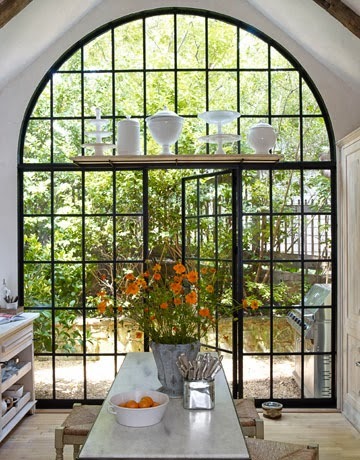 I am a fan of steel windows in general, but arched steel windows have particular appeal. Another picture of this room, from a different angle, shows the windows even more clearly. This image is from the Segreto blog – they created many of the specialty wall finishes in the house. It’s interesting how neutral the room appears in this photo, and what an impact the pillows, throw, and flowers had on the styling. Either way, it’s a beautiful space. Image source. The exterior view of the window featured in the room above. I wonder if the owners ever close the shutters? When looking through Leslie Sinclair’s beautiful book Segreto: Secrets to Finishing Beautiful Interiors, this room in particular, with interiors by John Kidd, had great appeal – in no small part because of the three arched steel windows. I love how the kitchen and family room in this house have a wonderful connection, and yet are distinct rooms. 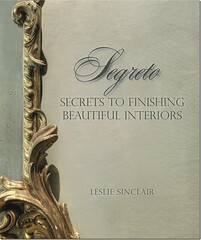 As a side note, Leslie Sinclair (the owner of Segreto Finishes) has written a book, Segreto: Secrets to Finishing Beautiful Interiors, and it is truly a gorgeous book. It is filled with page after page of European style projects that the team at Segreto have worked on, all beautifully photographed, and most never before published. Segreto specialize in exquisite paint and plaster finishes, and the caliber of their work and the work of the designers, architects, and builders can be seen in page after page of houses and rooms that are featured in the book (the book is huge - there are literally 300 hundred of pages of inspiration). I found the finishes and décor of the spaces to be inspiring, and I also studied every architectural detail of the houses and rooms in the book – many of the houses are new or recently remodeled, and the floor plans and architectural details are fascinating to me. The book can be found on Amazon here. Over on Brooke Giannetti’s blog Velvet & Linen, I immediately noticed the arched steel window/doors that she and her husband Steve installed in their new house, Patina Farm. Via Velvet & Linen. And another one in the bedroom while it was under construction – the airiness of the steel doors create an incredible indoor/outdoor feel, and enhance and frame the incredible view. Via Velvet & Linen. This beautiful bathroom from a Summerour designed house in Atlanta was featured on This Photographer’s Life, and she proclaimed it to be the prettiest bathroom she had ever seen. 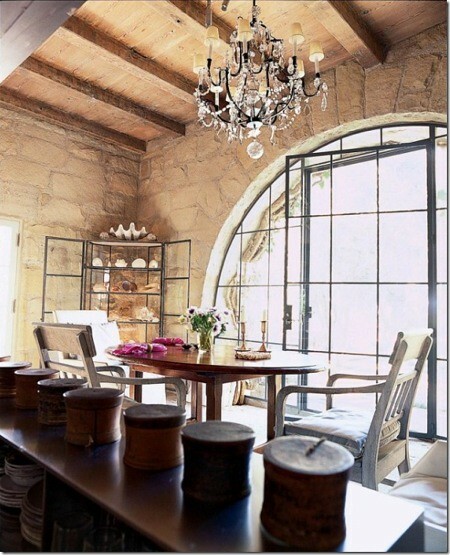 I wholeheartedly agree – it’s a stunning space, and I think the arched steel windows are what make the room. It creates a perfect indoor-outdoor connection. Notice how some of the panes on the windows facing the pool open, as these are windows and not doors. Also note the sphere in the corner – wish I had remembered this picture when I wrote my last post! Another home in Atlanta features steel windows, this one designed by architect Bill Litchfield. 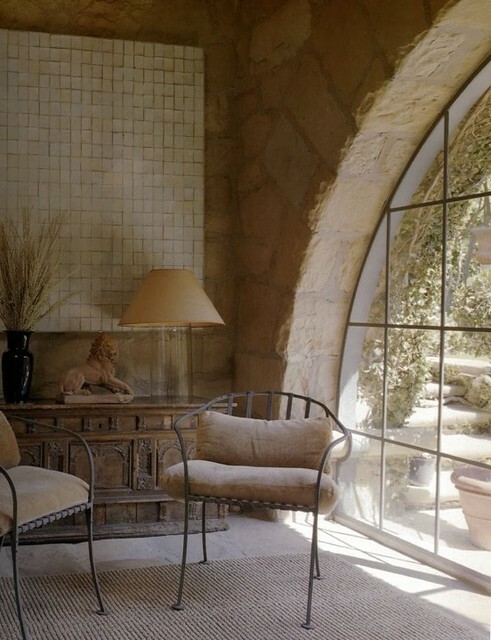 Arched steel windows define many of the spaces in this house. Interiors by Jackye Lanham, from her website. Another arched steel window from the same house. One of my favorite houses designed by McAlpine Tankersley (featured in Veranda several years ago), and one of my favorite pictures from the article. The guest room (perhaps it is a guest house?) features a large arched steel window, as well as a steel window featuring a quatrefoil shape. Another McAlpine Tankersley project with a steel door in the entry. I like how the door is oriented on the side instead of the middle. 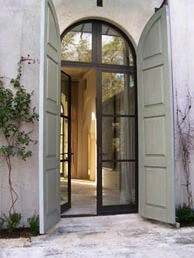 A favorite house I featured in my awning/overhang post has three arched steel doors. 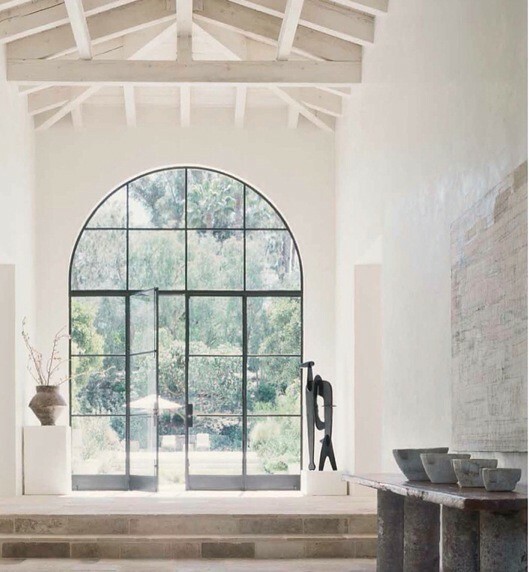 This arched steel door/window is from John Saladino’s house in Montecito, featured in his beautiful book Villa (the book is about the design and renovation of this beautiful Montecito estate). The house has since been sold to Ellen DeGeneres. 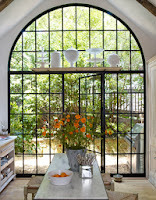 Another incredible arched steel window from Saladino’s house. 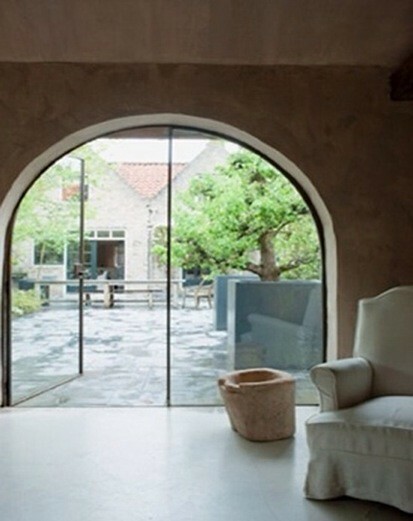 An image found on Pinterest – the arched steel door/window brings in incredible light in this space. 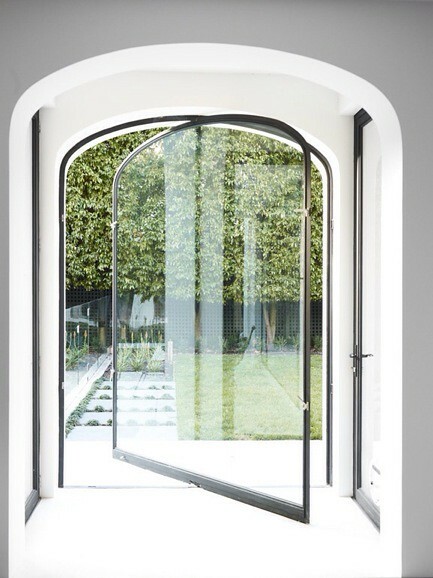 I noticed that I have been writing ‘door/window’ quite a bit in this post, and this is one of the great features of steel – it creates an architectural feature that is both window, letting in light and views of the outdoors, as well as door, opening the house to the outside. These steel doors are so minimalistic, it is almost as if there is no door there at all! It’s incredibly beautiful. I wonder how many birds have flown into this door? Via Belgian Pearls. Finally, an interesting design found on Pinterest. The door/window pivots to open. I wonder how this design holds up to the elements, especially when it rains? It is certainly architecturally interesting. 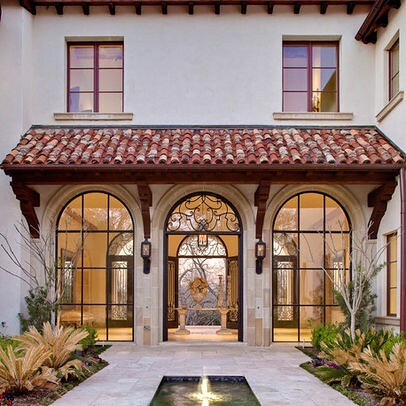 I hope you enjoyed this post on arched steel doors and windows, an architectural and design element that has become one of my favorites. I love how they combine an elegant shape, a thin profile, and a way to bring abundant light into any space where they are incorporated. I receive so many inquiries from shops, blogs, architects, designers, artists, and home related vendors about advertising opportunities on the blog. Please see my advertising information page for more details on sponsorship opportunities available for the month of October. This is one of my favorite looks. Do you think it is trendy? I also wonder about how cold or hot the windows get. They look like single pane. If anyone can let me know I would appreciate it!!! I have some steel windows in my house. They are single pane, and they get very cold in the winter. We have to close the curtains at night to keep the heat in. I love them, though - they are beautiful. oh you have touched on my favorite design component. the first home i bought was built in 1942 for the chicago's world fair, way out in the burbs, people traveled to see "the house of the future". which of course charming steel windows were a component. all was great until my first winter, on one particularly windy day, while watching tv under my window, my hair began to blow......NOT good in a northern clime! I have always admired them in photos. I have recently been in a few Atlanta homes which had them, and they were striking! Yes. What a kitchen. I'll never forget turning a corner in the garden and seeing it for the first time. John Saladino's steel doors were the inspiration for the ones we had fabricated for our house. The mullions are very thin, only allowing for single glazed panes. We will have to see what happens this winter! Thank you for including our house in your post! In the next couple of years I will be replacing the original arched wood doors and windows with steel,... is it wrong that I want the wood to degrade a little faster? Gorgeous post! They look great! What a nice collection. There is so much I love about steel windows, and maybe living in Southern California the cold wouldn't be an issue. Great post and wonderful images. I so wish we hadn't already replaced our windows once with our wonderful, roll out, etc…windows because I would do steel in a heartbeat just for the looks! So beautiful! And I remember that article on Jill's house in House Beautiful all too well! I think I might have even used a lot those pictures in a post on windows myself. Oh well…I can't change what I have now but I sure can dream! Love your choices in anything to do with a home, Holly! Your taste is impeccable! Great to see the love of steel windows and doors is still so strong. As manufacturers and exporters (from the UK) of these since 1849 we have seen the fashion trends come and go, but the beauty of steel windows still prevails! I see some comments about single pane cold windows. These are nowadays fully hot dipped galvanized (by us anyway! ), factory polyester powder coated and double glazed. Still the same authenticity, still the same timeless quality - but with added advantages of longevity and greater insulation. Thank you "Things That Inspire" for showcasing these architectural gems. Wonderful post, Holly! Unfortunately these handsome windows and doors are not so common here in DC. Perhaps it is because of our cold winters. The single glass panes do not offer much insulation and are not energy efficient. I really love the look! These are gorgeous! However, I remember as a small child the steel casement windows in my grandparents' home that didn't seem to stop the cold at all. Until they are made double paned and sealed, as the UK writer above indicates, (which would also make them even more expensive), they are not practical from an energy efficient standard, so really only make sense in a mild climate. Jill Sharp Brinson's home is one of my all-time favorites.